Blogger/Reader BK: I know what the TF says and I know what the CBO says,and I think they are both wrong. We will top out the Fund at a much lower number $2.8 T and it will come much sooner than anticipated. 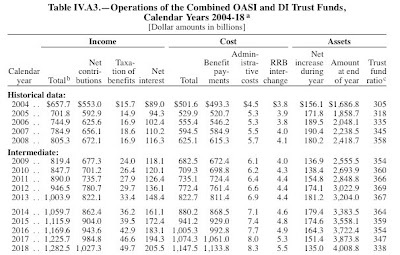 To see why this isn't so and actually just can't be we need to inspect the following table from the 2009 Report Table IV.A3.—Operations of the Combined OASI and DI Trust Funds, Calendar Years 2004-18. The second column from the right shows the Combined Trust Funds projected to go from $2.4 trillion in 2008 to $4.0 trillion in 2018. What would it take to freeze it at $2.8 trillion? Discussion below the fold. Well to freeze the Trust Fund at any given value obviously 'Net Increase in Assets' for the year has to go to zero. And this can only happen if total 'Cost' equals total 'Income'. And this is where our reader goes off the rails. For Social Security 'Income' is the sum of 'Contributions' (payroll tax), 'Tax on Benefits', and 'Interest', on the other hand 'Cost' is the sum of 'Benefits', 'Admin', and RRB Interchange (another kind of benefits). All three cost components and the first two income components are in the form of cash flowing in and out of Treasury and so are a measure of current year cash-flow. The CBO calls this 'primary surplus/deficit'. On the other hand interest does not come in the form of cash or checks, like the interest on your simple savings account it shows up as a credit, but like that interest payment does shows up on your balance. So in order to calculate 'Increase in assets' we take 'Primary surplus/deficit' and add interest which in 2008 gave us an increase in TF balance to $2.4 trillion. The 2009 Report projected an 'Increase in assets' of $137 billion for 2009, $138 bn for 2010, and $154 bn for 2011 for a total of $2.9 trillion. What would it take to get that end sum down to $2.8 trillion? Well it would mean that $100 billion in interest that would have been credited as an 'Increase in assets' had to be go somewhere else and the ONLY place that can be is to offset a larger than expected primary deficit'. In this case in order to keep the TF Balance from going to $2.9 tn you need an ADDITIONAL $100 plus billion of primary deficit over those three years. Including of course last year. How did we do last year? BK tried to figure that out from monthly numbers from SSA. Well Nancy Ortiz and Some Guy explained why that was a bad idea, those spreadsheets are working tools subject to all kinds of variation. On the other hand the Treasury publishes Monthly Trust Fund Reports that are pretty much the final word, at least I have not found in the past any varation between their Dec 31 totals and the year end total printed in the Annual Report (due in the Spring). And luckily for us the December final was published yesterday. Since each Trust Fund is legally separate for Treasury Dept purposes there are two reports each month, one for OASI and one for DI . The OAS Report ftp://ftp.publicdebt.treas.gov/dfi/tfmb/dfifo1209.pdf shows an ending balance of $2.318 trillion dollars. If we go to Table IV.A1 we see this is up from 2008 year end of $2.203 tn but fell short of anticipated $2.349 tn. And because of the way the math works ALL of that shortfall came on the receipts side. But unless those receipts fall so short that ALL interest has to be tapped to make up the difference then the TF balance will continue to go up. If we add these numbers together we would get a 'Net increase in assets' for combined OASDI for 2009 of $108 billion to a total of $2.53 tn. And here is the key point our commenter missed in order for the INCREASE to be less, next year has to be WORSE than last year, in order for that increase to be ZERO next year has to be a LOT WORSE. Because not only would results have to be bad enough to gobble up an amount equal to the interest that made up the net increase but also any interest on that interest. In order to keep the Trust Fund to growing to $2.8 trillion we have to project an EXTRA $50 billion in decrease in 'Net Increase'. Well that might well be, there is nothing implausible about reducing the RATE of growth of the TF balance by having only $225 billion in net increase in 2010 and 2011 instead of projected $275 billion, a year end TF balance of $2.8 trillion or less in 2011 would not at all be surprising. On the other hand it would not on that account be frozen. Because a $2.8 trillion Trust Fund still throws off a certain amount of interest and in order for that to NOT give you a positive 'Net Increase in Assets' then primary deficit has to come in at more than the total amount of interest earned that year. Meaning that not only would 2010 and 2011 have to be significantly worse in terms of revenue than 2009 but 2012 would have to be MUCH worse (the effect ultimately damps out). In order for the Trust Fund to 'top out' it needs to run systematic cash deficits in excess of $120 billion a year. Forever. Other wise the insidious effects of compound interest continue to work on the balances. We are in a deep unemployment recession and the resulting decrease in payroll tax receipts has resulted in a decrease in the RATE of increase of Trust Fund Balances, but in order to get that rate to go to zero we would need to have an immediate decrease in payroll contributions of $8 billion plus a MONTH to eat up the roughly $100 billion plus of interest the current TF will earn this year. Which would mean a drop in around $775 billion in total payroll (quick numbers, please check) which is more than triple the total of wages in covered employment. This literally can't happen. Yep too quick. The right numbers are found here: http://www.ssa.gov/OACT/TR/2009/VI_OASDHI_dollars.html#133537 which shows taxable payroll right at $5.6 trillion, $775 billion is 14% of that meaning we would need maybe 25% unemployment to eat up that interest income in the short run. But there is no set of numbers that would have the Trust Fund top out at $2.8 trillion in the next two years, the momentum of the existing TF balance and the interest it accrues are simply too great to be entirely overcome by a shortfall in tax income over the short run.